Mercedes made a big step when it decided to abandon its upright A- and B-Class in favour of a new, sportier but at the same time more conventional range of small front-wheel drive cars. It moved out of a narrow niche to offer a wide range of models based on its new MFA compact car platform, which has a transverse engine installation with the gearbox alongside, like most of today's family cars. There will be at least five MFA different variants: the A-Class hatchback; B-Class, taller hatch/MPV; the CLA coupe-styled four-door saloon; the GLA compact SUV; and a mystery fifth, thought to be a Shooting Brake version of the CLA. Of these, the CLA and GLA are likely to be of most interest and relevance to the Indian market. 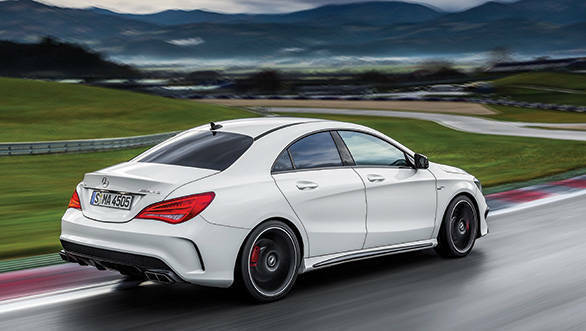 And, while the hatchbacks are popular in Europe, the CLA is the version that will make the difference for Mercedes in America, China  and India. The consensus, after the initial test drives in unseasonably bad weather in the South of France, was that the CLA will be one of the big hits of 2013. There are other four-door coupes around  but not in the premium compact class. The trend was started by the Mercedes CLS but followed by Audi and BMW, not to mention the low-roof Volkswagen Passat CC. And that's where the CLA comes in  smaller, more stylish and better equipped than the CC and, in the US, significantly cheaper (Rs 16.4 lakh before duties). Audi has just presented the first saloon version of the A3 but it looks staid compared with the four-door coupe with the three-pointed star. 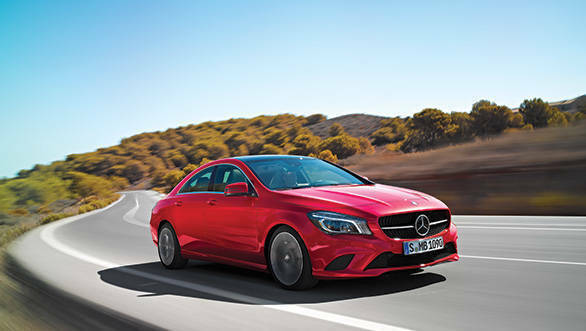 The CLA, with its low roofline, frameless door glass, and drooping tail, also scores in efficiency: it has the lowest drag coefficient of any mass-production model  0.23. The engine choice is much the same as other MFA models  180 and 250 petrol, 1.6 and 2.0 respectively, and 200 and 220 CDI diesels of 1.8 and 2.1 litres, all four-cylinder, direct-injection and turbocharged  and it was announced at the New York Auto Show in March that a CLA 45 AMG will join the A45 AMG with an astonishing 360PS and 450Nm from the 2-litre engine. The A45s will have  and need  4-Matic four-wheel drive, which is also available on some of the lesser models. 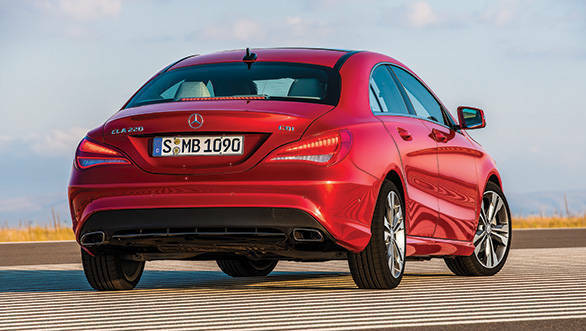 We drove the CLA250, with the 211PS 2-litre engine, in both front- and four-wheel drive versions. On a dry road, with wide tyres on 18-inch wheels, the front-driver was never short of grip but on a slippery surface after a rain storm (and they have had plenty of those in the south of France this year), the added security of the 4-Matic system was immediately felt  and much appreciated. It is interesting that Mercedes, like BMW, is banking on most customers not knowing or caring which end of the car is driven. Front-wheel drive is a bigger risk for BMW, who have made a marketing point of the superior dynamics afforded by the front engine-rear drive layout. BMW's first front-driver (apart from the Mini, intentionally a separate brand) is not due until 2014. Expert drivers will notice that the CLA's steering does not have the tied-to-the-road feel of a good rear-wheel drive car but that may be odd effects of the 'Direct Steer' electric power assistance. This is a car that rewards braking late and getting on the power early coming out of a corner. Having criticized the A-Class for the harsh ride provided by its optional sports suspension, it is pleasing to find that the CLA is a little more compliant; in fact, for most people in most circumstances, the 'comfort' suspension is to be preferred. There is no variable damping on the CLA250 but the seven-speed twin-clutch DCT gearbox has sport and manual settings, which you need to use if hurrying along. And performance is peppy for a 1,500 kg saloon: 0-100 kmph in 6.7 seconds and a top speed of 240 kmph. As on the bigger Mercedes, the transmission selector is a column stalk, with manual changes made by paddles behind the steering wheel. Left to its own devices, as an automatic, the DCT is reasonably smooth in operation but not as sweet as Volkswagen's DSG. Mercedes' biggest problem with the CLA might be the business it takes away from the C-Class which is about the same size but conservative where the CLA is radical  and Rs 2.5 lakh (before duties) more expensive. That will be solved  Mercedes hopes  when the next generation C-Class appears next year, bigger and more elaborately equipped than the current model. 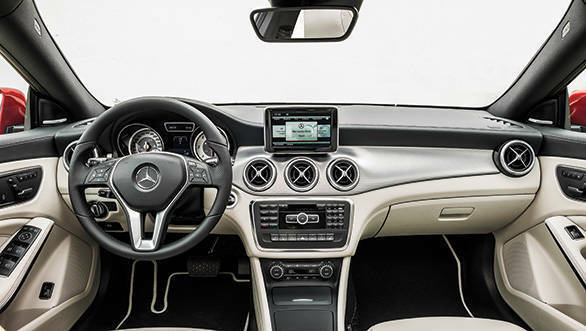 The CLA's coupe style limits rear quarter vision, restricts headroom, and makes rear compartment somewhat claustrophobic but those who are attracted won't mind any of that. It looks likely to start a new trend  and have a worldwide appeal. 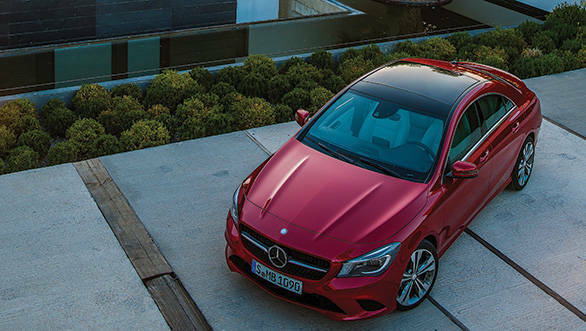 Mercedes will make the CLA alongside the B-Class at its new factory in Kecskemet, Hungary. The A but Mercedes has already commissioned Valmet in Finland to build an extra 100,000 A' over three years to meet the initial demand. These cars will also be made in China and at least some versions will be assembled in India. Mercedes has yet to say which models will be made here. The CLA looks like a good candidate.